Huge in size and colossal in beauty, Gaurishankhar Lake, also known as the Bhavnagar Lake, was made in 1872 as a water reservoir for the general public on the edges of the Victoria Park. 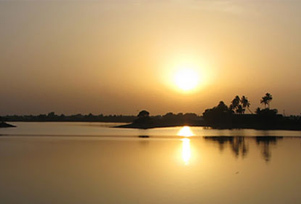 Today, the Gaurishankhar Lake, along with the adjoining Bal-vatika, is a famous picnic spot for the people of Bhavnagar. For the avid nature lovers, there is a forest nearby the city constitutes over 1 lakh trees. Nurseries amidst the forest cultivate a unique variety of flora that leave tourist awestruck. During the festival season, the Gaurishankhar lakeside becomes a perfect venue for various fairs, which adds to its popularity.